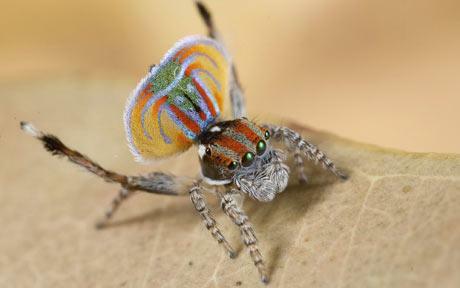 "The tiny arachnid, found in Australia, shows off a rainbow of colours to impress nearby females. It can raise a pair of legs and fan out two brightly patterned flaps at the back of its body. Also known as a Maratus Vilans, amateur photographer Jurgen Otto originally spotted the colourful creature in the wild. The spider also uses its third pair of legs in the mating display, raising them to show a brush of black hairs and white tips. The spider can also jump, but the common belief that it can use its patterned flaps to glide through the air is an urban myth which has been debunked by the Australasian Arachnological Society. The spider is found in eastern parts of Australia, including Queensland and New South Wales. Both sexes of the spider rarely reach more than 5mm in body length. Females are brown with no distinct pattern."